What Is The Best Home Blood Pressure Machine? This Week I want to talk to you about Home Blood Pressure Machines. Which is the best one? When do I take my blood pressure, and how often? Home blood pressure machines are an effective way for us to learn more about our blood pressure and keep a close eye on what’s an extremely important element of our health. Put simply, the higher your blood pressure is, the higher the risk is of developing health problems in the future. Portable blood pressure monitors are long established as being a convenient and effective way to monitor our blood pressure, but is there an optimum time of the day to use them? Whilst there is no right or wrong time to take your blood pressure, there are a few factors you should consider in order to make the most out of your home blood pressure machine. The Mayo Clinic advises to avoid measuring blood pressure immediately after you have woken up. This is due to the fact our blood pressure is typically at its lowest on waking and therefore will not provide a truly accurate reading. The May Clinic also advices to avoid taking any medication before using the device. If you do exercise when you wake up, use the monitoring machine before you do any exercise for a more accurate reading. Drinking tea, coffee and alcohol for at least half an hour before using the blood pressure monitor may result in you having a higher reading. It is therefore advised to refrain from drinking these substances prior to using the device. A full bladder can also affect your blood pressure, so always go to the toilet before you check your blood pressure. You might be tempted to take your blood pressure reading at the same time each day. However, measuring at different times will give you a more accurate assessment of your blood pressure overall. Taking the reading at different times will factor in different elements that can affect our blood pressure, such as hormone changes, stress and activity level. One of my favourite blood pressure machines is the Omron M6. 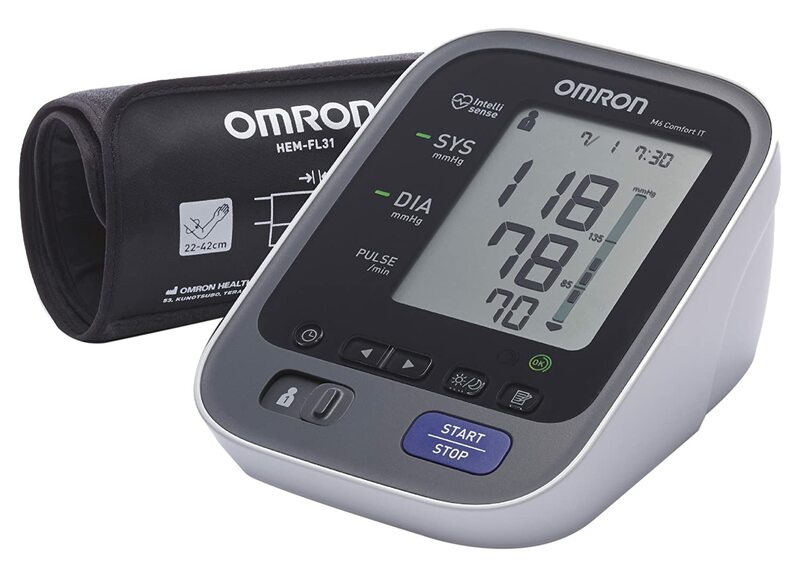 If you are on the lookout for a quality blood pressure monitor for home blood pressure checks, the Ormon M6 Comfort IT Upper Arm Blood Pressure Monitor is a quality device, designed to give accurate assessments of blood pressure. The machine connects to Bi-Link, so an internet connection is required, where users have free access to Health Management. The Ormon M6 Comfort IT Upper Arm Blood Pressure Monitor has advanced averaging, irregular heartbeat detection, a morning hypertension tracker, as well as an easy blood pressure colour indicator. However, my new favourite is the OMRON EVOLV. There are many blood pressure machines available, these are two of my favourites. Or to view all the blood pressure monitors we have available visit our blood pressure page. Previous PostPrevious How to Get Rid of Lice & Nits for Good!